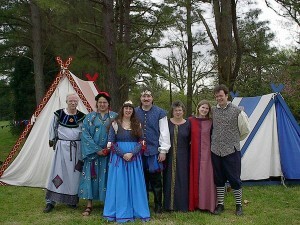 All I have ever wanted to camp in at Pennsic is a red and white Viking A-Frame tent . I designed a Viking Tent which can be made for about $200. In the 1990’s that tent cost about $120. It uses a few short cuts and it is not 100% period, but it works. It has been through a number of serious storms while camping. I have taught a class and made (or helped to make) 4 tents. 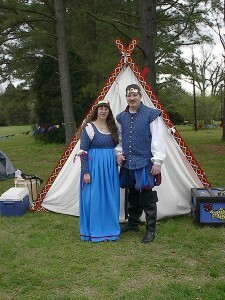 After I got married there was some complaining from my tall husband about hitting his head on my tent. That is when we made the larger of the two tents. It was red and white the first year it went to Pennsic and then it sun faded to pink and cream. I was very sad. My brightly colored tent made it possible for me to drink at Pennsic and not worry about going into the wrong white canvas tent. Every once in a blue moon I get questions about my tent, so I am keeping the handout on my new website.